Sometimes, I have believed as many as 6 impossible things before breakfast. 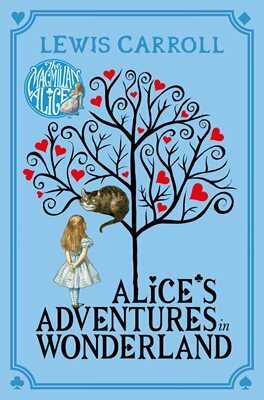 Let me just get my overall point of this book review straight to you: Alice’s Adventures in Wonderland is THE MOST nonsenical book I have every read in my life! 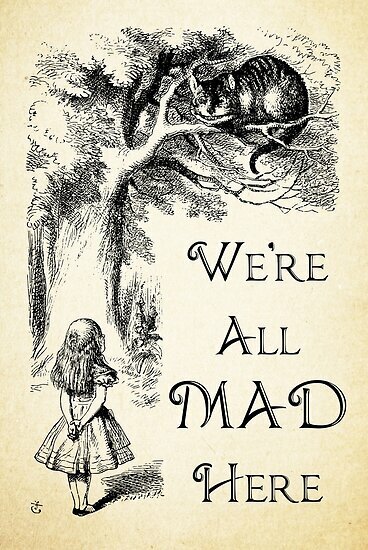 NOTE: I am not implying anything negative by saying that this book is a complete waste of time, just that I want to state the fact that this book gets curiouser and curiouser (As Alice puts it herself) and stranger and stranger the more you read it and try to make sense of it. And that’s the whole deal about it, really. Caroll wrote this book in a way so as to not make any overall sense to it. Basically, don’t try to find any logical conclusions from what you read, just go with the flow and let the whole narrative amuse you! “Curiouser and curiouser!”, cried Alice (She was so much surprised, that for the moment she quiet forgot how to speak good English). As Alice goes from place to place, she encounters the creatures who speak to her in riddles, give her poems and do all sorts of odd things. From time to time, she wonders if she has changed into another person and is not herself anymore. “Dear, dear ! How queer everything is to-day ! And yesterday things went on just as usual. I wonder if I’ve been changed in the night? Let me think: was I the same when I got up this morning? I almost think I can remember feeling a little different. But if I’m not the same, the next question is, Who in the world am I? Ah, that’s the great puzzle !” And she began thinking over all the children she knew, that were of the same age as herself, to see if she could have been changed for any of them. This is a book that doesn’t really need to have a well-defined and logical flow of events. Anything can happen at any point of time without there being a reason to explain it. So at once moment, Alice could be carrying an oversized child of the Duchess and the next moment saucepans could fly out of nowhere and after that the oversized child could turn into a pig and scamper off into the jungle. Alice has funny and absurd conversations with the March Hare, the Dormouse and the Mad Hatter at the tea-party. (I was surprised at how differently the Mad Hatter was portrayed so differently in the 2010 movie ‘Alice in Wonderland’ starring Johnny Depp). They follow one thread of conversation for some time and then someone abruptly changes the topic, making the whole tea-party comical. “Have some wine,” the March Hare said in an encouraging tone. Alice looked all round the table, but there was nothing on it but tea. “ I don ’t see any wine,” she remarked. “There isn ’t any,” said the March Hare. I couldn’t help but compare this book with Peter Pan (reviewed here). Contrary to Neverland in Peter Pan where everyone follows Peter’s instructions and make him the centre of their existence, in Alice’s Adventures in Wonderland, Alice is mostly rejected by everyone. Either she gets offended by someone or ends up offending someone else. She has been depicted as a rich, spioled brat who demands certain things to be in a particular way, which the creatures of Wonderland don’t like at all. This book is completely hilarious and the funniest and most peculiar character is undoubtedly the Queen of hearts. She keeps shouting orders to cut off people’s heads at the slightest display of insolence and everyone seems to be in terror of her. For instance, there was a scene where Alice sees three soldiers (named “Two”, “Five” and “Seven” – a personification of the playing cards) busy painting the White roses on a rose tree red. When Alice asks them why they’re doing so the soldiers reply by saying that there ought to have been a red rose tree in the first place and if the Queen were to find out about this mishap, she would have their heads off. So they were painting it red before she comes for her round hoping that she wouldn’t notice (This amused me a HELL lot!). I read a few posts on the internet about the mathematical logic and political mockery hidden subtly in the book, pointed out by a few experts. This book was written to mock the then Victorian ways of life, which appealed to people in those times a lot. I would recommend you all to check it out after you read this book. This is a classic example of the genre of literary nonsense that is much adored even to this day by children and adults alike. It easily kept me hooked till the end and I just wished there was more to it. I plan on reading the sequel – ‘Alice Through the Looking Glass’ some time later. Let me know if you’ve read these books. Xia ci zai jian!